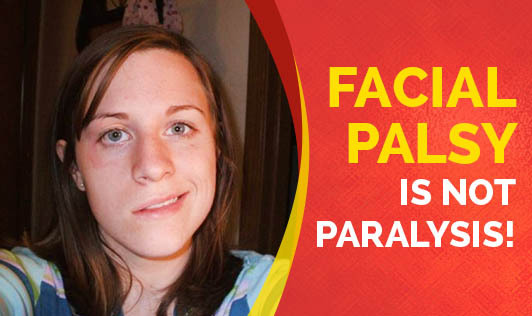 Facial Palsy is not Paralysis! Bell's palsy or a facial palsy which causes sudden weakness or paralysis on one half of the face is not associated with stroke, and most people recover completely, it's still advisable to seek emergency care to confirm a diagnosis and start treatment, which can up the odds of full recovery. The disorder is often related to a viral infection. The nerve that controls facial muscles passes through a narrow corridor of bone on its way to the face. If the nerve becomes inflamed or swollen, typically due to a viral infection, it can become compressed, irritated and injured in this narrow pathway. The result is Bell's palsy. Bell's palsy can affect anyone, at any age. The condition is most likely to occur in people who have certain viral infections, such as cold sores or upper respiratory infections, and in those who have Lyme disease or diabetes. Treatment increases the likelihood of full recovery and may help shorten the recovery time. A doctor may prescribe a course of oral corticosteroids to help reduce inflammation around the facial nerve. A physiotherapy treatment is very much important for the complete recovery. For most people, symptoms begin to improve within a few weeks. Complete recovery may take three to six months or even longer in severe cases. About 85 percent of those with Bell's palsy recover completely.